A light breeze rustled the sage brush filling the air with its ancient aroma. Each horse was backed out of the stock trailer and the sound of hoofs on the wooden ramp echoed off into the darkness. A nip was in the air and the sky was beginning to lighten signaling the coming sunrise over the South Hills. This was not Uncle H’s his first wild horse hunt, but he was full of anticipation. He was aware of the danger involved in this endeavor but where, when and how it would come he was unaware, maybe that was half of the thrill. On the last trip they had spotted a special horse, a young sorrel with a white blaze on his forehead. They hoped to find his band today. He was full grown, but still young, powerful and wild. He looked as if he could run like the wind. They knew a horse like this would only be caught using a keen strategy. It was not that long ago when Uncle H had been told he was either too young or too little for such hunts, but now at 16 years old, here he was expected to hold his own. Today the plan was to get to the shallow valley where the horses came for water in hopes the band would be there. It didn’t take them long to adorn their spurs, tie down some food and make ready their lariats. The three brothers headed out following a winding route south picking their way through the sage brush. Just as they hoped, it wasn’t long before they spotted the band of about 15 horses and the white faced beauty stood out amongst the bays, palominos and blacks. The mustangs heard the brothers coming before they saw them. The brothers rode south along the ridge of the shallow valley constantly drawing closer to the mustangs. This was a good place for the stallion to bring his band. It offered plenty of feed, water, and a good view of any approaching danger. The stallion watched the three horsemen making their way closer. Drawing closer, restless hoofs could be seen stomping. It was if a line had been drawn and when the brothers crossed it, the stallion began moving his harem away to the east. That was the signal, Uncle P took his leave. He was a good horseman and born a century too late. If it had four legs, Uncle P wanted to hunt it. He took off at a full gallop. They had found when chasing mustangs, the horses would make a wide circle and return to where they started. At the completion of that large circle that was when the stallion would be caught. The remaining two brothers had a good 45 minute wait ahead of them. They found a large boulder surrounded by tall sage brush. This combination gave them good cover while they waited. It didn’t take the mustangs long before the stallion changed his tactic from evade to escape. The group was now moving full out. Up and down ravines they raced. Many of the old mares hooves were as big as platters having never been trimmed, and as a consequence they were not fast, but they all had wonderful endurance. A horse is designed to run and run they did. Uncle P closed the distance pushing the tribe on. His goal wasn’t to catch his prize yet but to wear him down. The stallion followed his band in single file while a dun mare led the band straight to the edge of the plateau. Down a 400 foot steep embankment they went, they took the grade at a full gallop. A ball of dust arose and rocks dislodged making the trail a dangerous path. Reaching the bottom they crossing a small stream, with water splashing, they funneled through a break in the thick scrub brush that lined the gully. Up and over ravines they ran into the morning sun. The mustangs began a long gradual turn back to the west and north. Eventually just as planned the band returned and broke the high plateau in the east and emerged at the head of the valley. Uncle P’s horse was nearly played out. He had enough left for a uniquely colored grulla colt that would offer him little trouble. Now firmly in the valley his mission was through, he urged his horse on crowding the colt. He sent the loop of his rope around the neck and reined him in. The band of mustangs piled by and Uncle H and Uncle W now began to move out with gusto charging hard and fast intent on the sorrel stallion. It took little time with a fresh horse for Uncle W to position himself for his first opportunity. He began swinging his lariat high over head. His horse instinctively moved in closer. The young stallion was not yet willing to be mastered by the rope and before the rope was sent flying the stallion veered hard to his left, splitting away from the herd. Recovering, the two brothers followed at full speed. Sage brush whipped at them stinging their legs. The chase went on with the young stallion attempting to out distance the two horsemen. Rushing on, a jack rabbit popped up and ran left then right ahead of Uncle H’s horse before finding a safe place. The race lasted for another two miles before Uncle W sent his loop neatly around the white blazed head. A quick wrap of the rope around the saddle horn and by reining in his horse the rope tightened. The stallion fought against the rope jerking his head left and right. Uncle W yelled instructions at Uncle H who was moving in toward the stallion. His first attempt went wide but on his second attempt Uncle H’s rope flew over the stallion’s head. Now with one rider to the right and one to the left the stallion’s capture was insured. He reared up and pawed the air but now the riders were safe and it was only a matter of time before the stallion submitted to the rope. Two hours later the two arrived at the truck with a tired stallion. There was an old but secure pole corral there. They put the stallion in the enclosure along with the smoky gray colt Uncle P had caught. The brothers took time for some coffee and admired their catch. Once rested the brothers headed back out to the plateau for some more fun and they added another colt. The day was getting late and it was time to load up. W still had his rope on the horse and P took no time getting hold of the second rope. After dusting myself off, recovering my horse, we again prepared for the load, which worked much better on the second try. The wild horse population in the US today, depending who is speaking, ranges from 13,000 to 33,000. 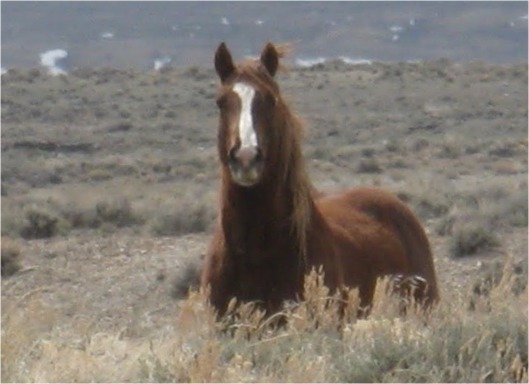 There have been attempts with legislation to protect and keep a healthy balance to the Mustang population here in the west. To say this discussion is controversial is an understatement. In the mid 1800’s accepted estimates of the wild horse population was between 5 and 8 million. Starting in 1915 a steady decline existed in the US horse population in both wild and domestic horses. It seems we exchanged are horses for our dogs. Approximately ½ million horses each year were sent to the dog food factories. By 1971 it was a crisis and the wild mustang was threatened with extension. President Nixon signed a bill protecting the wild horse population and turning the management of these horses over to the Bureau of Land Management (BLM). There is no shortage of critics of the job the BLM has and is doing. In reading some of the critic’s writings, it is hard to argue that BLM’s methods are not indeed cruel, if the reports are accurate. BLM position is that the herds need thinning and so roundups are scheduled about once every four years. These roundups are done by helicopter, often in 90+ degree weather, pushing the horses for miles to holding pens. The result is that the very young and the old sometimes expire from exhaustion and overheating. In an August 10, 2010 round up in Nevada it was reported that 34 horses died. This does seem cruel and over the top and it seems there should be a better way. In addition, the herds numbers seem low in what the BLM deems appropriate for the size of range these horses have available to them. Granted I know little to nothing about range land and what a correct horse per acre ratio should be, but in Idaho the BLM has established for the 477,656 available acres the appropriate population for wild mustangs is a mere 617. The wild mustang holds a romantic ideal with those of us who love the stories of the old west. It is a shame that Uncle H was one of the last to be able to hunt and capture a wild mustang. My thoughts wandered while reading this. First I was taking the horses side, wanting him to escape. And then I realized that the stallion in the story was born in better times. Personally, I have no opinion on the discussions of what to do with surplus animals. Use fertility control measures, slaughter them using ‘humane’ methods, round and transport them separated from their families more ‘humanely’, ban slaughter, shelters, animal shows, dog food…. What’s the point of discussion? I sound depressing, I just realized. Great post Grayquill. I would love to read the comments on this one. I got all excited when I saw Uncle H was about to speak and that picture roped me in. Beautiful horse. You and Uncle H did not disappoint, quite a story. I too am conflicted about all the wild animals we are crouding out and methodically destroying. There has to be a better way outside of reducing their population or ours. They operate a wild horse sanctuary. Thanks for a really entertaining yet provocative post GQ. is a better link. Not all her posts are about horses. I wonder.... if you catch some horses from the wild, do you have to pay anyone or finders keepers? Were there special territories to hunt for mustangs? Always enjoy reading about Uncle H and today with the horses was a particularly good one. Wish I had some answers to the problem -- wish someone did! I owned two horses for a number of years. Great animals! Hope you have a good week! Uncle H is so cool! Visited the links...very interesting and complex. Choco: The BLM up to this point has tried to capture the young and put them up for adoption. The trouble, there are more horses than adopters, if that’s a word. IN 2004 a law was passed to allow a horse to be euthanized or sold to a slaughter house if after being put up for adoption three times it was still not adopted. Once these round ups are completed, the horse are given their shots for disease and a certain ones are released back into the wild – mostly the older ones. The critics say this is resulting in the quality of the mustang is being degraded as they reproduce. Arkansas Patti: I think these sanctuaries make a lot of sense. I have not checked out the links yet, but I will – thanks. Shadowthorne: A private citizen no longer is allowed to catch these animals (see my comment to Choco). I believe when my Uncle was catching the Mustangs they were free for the catching and no fee was required. Sylvia: Thank you! I always enjoy reading your comments. I hope you are staying warm. Amrita: Yip! Thanks for stopping by. Wanda: Complex is a great description. It seems whenever there are two or three sides to an issue the complexity multiplies. Thanks for stopping by. I'm new here and haven't read many of your posts, but I like what I've seen so far. As one who loves both horses and stories about the Old West, I was immediately drawn into this post. I'll be back. A light breeze rustled the sage brush filling the air with its ancient aroma. This was a lovely read, very absorbing. I could almost see it in front of my eyes like a movie. Anita: That was a unique time – still today there are many ranches where much of the cowboy work is still done on the back of a horse. Little by little branding is being replaced with micro chip, but round ups are still required to give the cattle and horses their inoculations required by law each year. But yes, I feel lucky to write about someone who actually lived that life. Linda: Welcome – thanks for stopping by! I hope to see you again. Silverline: Thank you, what a great compliment. You’re the best! A friend's father lives on a res in Nevada and he still rounds up a few wild horses each year. We had a fair size horse herd on the home ranch, til we started using 4 wheelers & helicopters. I have moments when I really miss those long days a horseback.